There are thousands of women, and increasingly more young ladies, who are in abusive relationships. Many want to get out, but feel or think that there’s no way to do so without putting their life or the lives of their children in danger. Or they have been convinced that “having a man is better than not having a man at all,” regardless of how he treats you. Secretly, they know the dangers or consequences that could occur because of the choice they’ve made, but they just don’t have the courage to do anything about it. 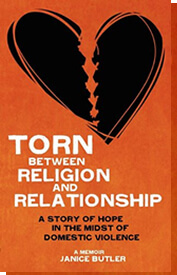 As a Domestic Violence Survivor and author of the biography “Torn Between Religion and Relationship,” Woman of Character, Inc. in conjunction with WordWorks Entertainment & Blinded By Ambition have written a screenplay that will help bring light to these issues. There are many self-help books written about abuse and self-esteem to help empower women to change their thinking and image of themselves. This feature film was written with the same purpose. Because this is a real-life story that women can relate to, this film will reach women and men that won’t otherwise read a book or go for counseling. We believe that as this film is seen locally, nationally and even internationally, the film’s powerful message will expose this “Silent Killer” and help save the lives of women and help put a stop to Domestic Violence.